The Boston Red Sox visit Tropicana Field on Friday, September 15, 2017 to play the Tampa Bay Rays. The probable starters are Chris Sale for the Red Sox and Matt Andriese for the Rays. The opening line for this matchup has Boston at -186 and Tampa Bay at +175. The Red Sox have a 63-76-6 over/under record and a 75-70-0 run line mark. The Rays are 70-77-0 against the run line and have a 72-72-3 over/under record. The Red Sox have a 82-63 overall record this season. Starting pitcher Chris Sale has a 16-7 record with an earned run average of 2.76 and a WHIP of 0.95. He has 278 strikeouts over his 195.2 innings pitched and he's given up 147 hits. He allows 6.8 hits per 9 innings and he has a FIP of 2.2. The bullpen has an earned run average of 3.19 and they have given up 383 base hits on the year. Teams are hitting .225 against the bullpen and they've struck out 486 hitters and walked 151 batters. As a team, Boston allows 8.4 hits per nine innings while striking out 9.5 batters per nine innings. They are 4th in the league in team earned run average at 3.68. The Red Sox pitchers collectively have given up 1,226 base hits and 536 earned runs. They have allowed 171 home runs this season, ranking them 22nd in the league. Boston as a pitching staff has walked 404 batters and struck out 1,388. They have walked 2.8 men per 9 innings while striking out 9.5 per 9. They have a team WHIP of 1.24 and their FIP as a unit is 3.76. As a team Boston is hitting .260, good for 8th in the league. The Red Sox hold a .409 team slugging percentage and an on-base percentage of .333, which is good for 10th in baseball. They rank 6th in MLB with 9.1 hits per game. Xander Bogaerts is hitting .270 with an on-base percentage of .333. He has 136 hits this season in 503 at bats with 54 runs batted in. He has a slugging percentage of .400 and an OPS+ of 91. Mookie Betts is hitting .264 this year and he has an on-base percentage of .344. He has totaled 151 hits and he has driven in 87 men in 573 at bats. His OPS+ is 106 while his slugging percentage is at .450. The Red Sox have 1,309 hits, including 262 doubles and 150 home runs. Boston has walked 512 times so far this season and they have struck out 1,080 times as a unit. They have left 1,026 men on base and have a team OPS of .741. They score 4.81 runs per contest and have scored a total of 692 runs this year. Tampa Bay has a 72-75 overall mark this year. With an earned run average of 4.46, Matt Andriese has a 5-3 record and a 1.39 WHIP. He has 62 strikeouts over the 70.2 innings he's pitched. He's also given up 73 hits. He allows 9.3 hits per nine innings and his FIP stands at 4.98. The bullpen has an earned run average of 3.81 and they have given up 421 base hits on the year. Teams are hitting .229 against the Rays bullpen. Their relievers have struck out 443 batters and walked 182 opposing hitters. As a team, Tampa Bay allows 8.2 hits per nine innings while striking out 8.3 batters per nine innings. They are 8th in the league in team earned run average at 4.03. The Rays pitchers as a team have surrendered 1,189 base knocks and 581 earned runs this season. They have given up 177 home runs this year, which ranks 17th in Major League Baseball. Tampa Bay as a staff has walked 457 hitters and struck out 1,199 batters. They give up a walk 3.2 times per 9 innings while they strike out 8.3 per 9. Their team WHIP is 1.27 while their FIP as a staff is 4.24. As a team, they are batting .245, good for 26th in the league. 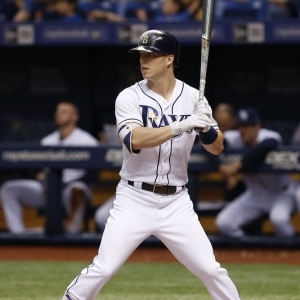 The Rays hold a .425 team slugging percentage and an on-base percentage of .317, which is good for 22nd in baseball. They rank 26th in MLB with 8.3 hits per contest. Corey Dickerson comes into this matchup batting .278 with an OBP of .322. He has 151 hits this year along with 60 RBI in 544 AB's. He maintains a slugging percentage of .494 with an OPS+ of 118. Logan Morrison is hitting .246 this season and he has an OBP of .352. He has collected 115 hits in 467 at bats while driving in 82 runs. He has an OPS+ of 134 and a slugging percentage of .525. The Rays as a unit have 1,209 base hits, including 211 doubles and 206 homers. Tampa Bay has walked 492 times this year and they have struck out on 1,395 occasions. They have had 1,007 men left on base and have an OPS of .742. They have scored 4.27 runs per game and totaled 623 runs this season.